There is a constant whisper among those that run workshops that nobody dares say too loudly for fear of scaring off future participants “It’s really hard to fill workshops”. Over the last decade, I’ve marketed a lot of events and workshops of varying sizes, from small intimate workshops with under 10 people to large informative events at the Welsh Assembly for over 100 people. I promote networking events that happen fortnightly and fight the constant battle of thinking up new ways to bring people through the door. It’s fair to say that I’m experienced in this area but also understand how difficult it is. It’s not easy to convince people to hand over their cash in exchange for something intangible like an event or workshop. What are they going to get out of it anyway?! This led Helene Jewell of Jewell Facilitation to approach me about delivering a joint course all about how to market workshops. (Helene is the Queen of Workshops and you can find out about our next workshop on this topic here). The thing is though, it’s quite a bold thing for us to say “Come to a workshop with us where we will show you how to get bums on seats!” What if we didn’t fill the workshop? We’d be left with egg on our faces! Fortunately, (or should I say obviously?) the first workshop sold out. There is a clear need for help in this area….BUT this blog post isn’t about our story; it’s about helping you to market your workshops! One of the things we did to promote our first workshop was create a series of weekly tips about marketing your workshop from our experience. 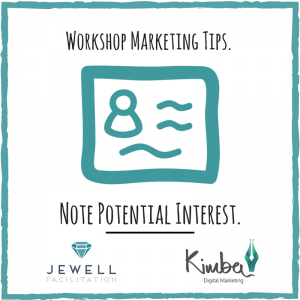 Be specific about your workshop aims before you start marketing it! 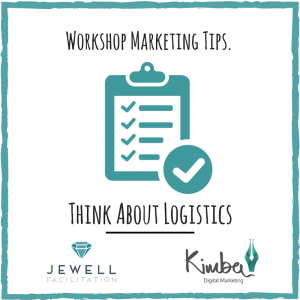 This way potential customers are clear on what they can expect to achieve and it will make planning your workshop much easier too. When you’re setting up your workshop check whether the venue, timings, price etc. fit with your target customer – make it easy for them to want to come! If your workshop is aimed at working mums, consider the school run and school holidays. Are you targeting people further away? Think about start and end times for the workshop to allow for travel. 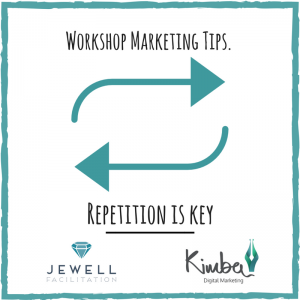 Work, family and even the washing up will get in the way of you marketing your workshop unless you have a plan in place (ideally in your calendar!) Second to that is implementation. It’s really easy to make a plan and then not implement it. My advice? Just get on with it…. You don’t need to be everywhere. You just need to be seen by the right people. Pick the right platforms to reach your audience. Rather than just telling people all about your workshop, engage them in conversations to find out what they need and are interested in, much more worthwhile! Helene has a Facebook group for people who have attended her courses in the past. We asked people in the group for their thoughts before launching the workshop. We’ve also done Facebook lives and asked people what their burning workshop marketing questions are. There is a lot you can do to engage rather than broadcast and you can then use what you learn for future marketing efforts. Try marketing your workshop somewhere you’ve not marketed before! You’ll reach new audiences and might find it works better than something you’re already doing. Just because someone has seen your workshop advertised, doesn’t mean they’ll be in the right head-space to buy there and then. They might not even notice it the first time. Remind people! A good example of this is these tips. We ran this series of tips on Facebook, Instagram, Twitter and LinkedIn weekly and Helene did the same on her channels ahead of our first workshop. We asked workshop participants if they had seen the tips and only 20% put their hands up. So we are running the tips again with different images on the lead up to our next workshop and I’m writing this blog about them too. It will be interesting to see how many of the participants have seen the tips next time. Moral of the story: you can repeat things online. A good workshop will be full of conversation. You can draw inspiration from these conversations to create marketing materials such as blog posts, tips and infographics. Don’t forget to collect feedback at the end if your workshops to use in your future marketing. A good feedback form is invaluable! You can also collect feedback in the form of video testimonials at the end of the session. You can see an example of this here. When you have happy customers they’re often pleased let others know about their experiences. Try asking past participants or clients for referrals to your workshop. Keep a note of interested people, either in a CRM or spreadsheet. Not everyone will be able to come to your workshop this time around, but when you’re ready to do it again another time you can check in with them. I remember Helene telling me about someone that was interested in her workshop but took months and months to finally sign up, they were genuinely keen on attending but had been busy for every new workshop date Helene planned. If Helene hadn’t been persistent they both would have missed out! I hope you’ve found this useful. 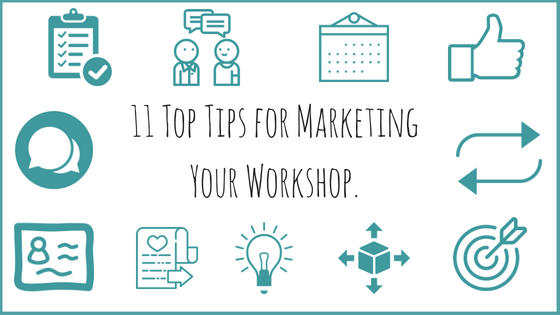 I would love to hear what your top workshop marketing tips are. Please leave a comment below! If you’ve got this far and want to know more about our Marketing Your Workshop Made Easy! course follow this link. Thank you for taking the time to read to the end!